A capacitor is one of the most used electronic components. It has the ability to store energy inside it, in the form of an electrical charge producing a static voltage (potential difference) across its plates. Simply, a capacitor is similar to a small rechargeable battery. A capacitor is just a combination of two conductive or metal plates places parallel, and are electrically separated by good insulating layer (also called Dielectric) made up of waxed paper, mica, ceramic, plastic and etc. Now, the point is how a capacitor work? When you connect power supply to the capacitor it blocks the DC current due to insulating layer, and allow a voltage to be present across the plates in the form of electrical charge. So, you know how a capacitor works and what are its uses or application, but you have to learn that how to use a capacitor in electronic circuits. How to Connect a Capacitor in Electronic Circuit? 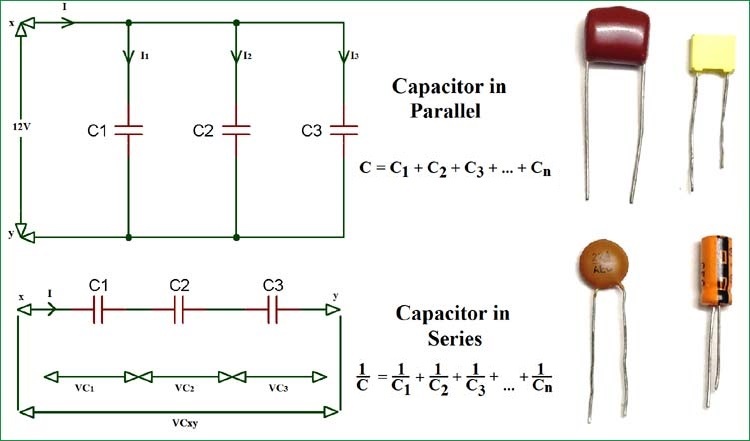 Here, we are going to demonstrate you the connections of a capacitor and effect due to it with examples. In a circuit, when you connect capacitors in series as shown in the above image, the total capacitance is decreased. The current through capacitors in series is equal (i.e. iT = i1 = i2 = i3= in). Hence, the charge stored by the capacitors is also the same (i.e. QT = Q1 = Q2 = Q3), because charge stored by a plate of any capacitor comes from the plate of adjacent capacitor in the circuit. Hence, the above equation is the Series Capacitors Equation. Now, in the below example we will show you how to calculate total capacitance and individual rms voltage drop across each capacitor. As, per the above circuit diagram there are two capacitors connected in series with different values. So, the voltage drop across the capacitors is also unequal. If we connect two capacitors with same value the voltage drop is also same. When you connect capacitors in parallel, then the total capacitance will be equal to the sum of all the capacitors capacitance. Because the top plate of all the capacitors are connected together and the bottom plate also. So, by touching each other the effective plate area is also increased. Therefore, the capacitance is proportional to the ratio of Area and distance. In the below circuit diagram, there are three capacitors connected in parallel. As these capacitors are connected in parallel the equivalent or total capacitance will be equal to the sum of the individual capacitance. When a capacitor is connected to DC supply, then the capacitor starts charging slowly. And, when the charging current voltage of a capacitor is equal to the supply voltage it’s said to fully charged condition. Here, in this condition the capacitor works as an energy source as long as voltage is applied. Also, capacitors do not allow the current to pass through it after it get fully charged. Whenever, AC voltage is supplied to the capacitor as shown in above purely capacitive circuit. Then the capacitor charges and discharges continuously to every new voltage level (charges on positive voltage level and discharge on negative voltage level). The capacitor’s capacitance in AC circuits depends on the frequency of input voltage supplied to the circuit. The current is directly proportional to the rate of change of voltage applied to the circuit. As you see the phasor diagram for AC capacitor in the below image, current and voltage are represent in sine wave. On observing, at 0⁰ the charging current is at its peak value because of the voltage increasing in positive direction steadily. Now, at 90⁰ there is no current flow through the capacitor because the supply voltage reaches to the maximum value. At 180⁰ the voltage start decreasing slowly to zero and current reach to maximum value in negative direction. And, again the charging reaches to its peak value at 360⁰, because of supply voltage is at its minimum value. Therefore, from the above waveform we can observe that the current is leading the voltage by 90⁰. So, we can say that the AC voltage lags the current by 90⁰ in an ideal capacitor circuit. Pls correct the equation in the introduction image. They are interchanged.